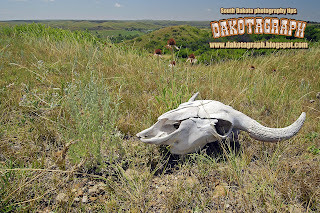 While it's not very likely to run across a scene like this in South Dakota these days, I do come across deer and other animal skulls and bones fairly often while hiking on the prairie and in the Black Hills. I have to admit I've been carrying a buffalo skull around in my vehicle for several months looking for a great place to shoot some photos of it. I finally found this spot overlooking the Belle Fourche River north of New Underwood. If you want to use this as your computer wallpaper, click on the photo to enlarge, then right click and "Set as Desktop Wallpaper."